Harbors - they are magnets to me. Safe harbors...gentle harbors... good harbors. Sometimes life is a succession of harbors. Plymouth harbor and beach roses in Massachusetts. Shrub roses in Bar Harbor. Life is sweet - tiny wild Maine berries that stops your heart and restarts it at a gentler pace. Life is delicious. Food from the sea. Appreciation. Sometimes you need the light to bring you to safety. Sometimes you are the light. And life is unpredictable. I am taking a blogging break - some time in harbors for thought. Know that I have smiles and appreciation for all of you, for all those near and for harbors and roses and delicious. Supposedly if you hang a mirror on a star and then had a telescope strong enough to see the mirror (and you got the mirror up there faster than the speed of light) you could see the past. That is the extent of my physics - a theory that could work but never will. In the past week I was sure I would finish And the Universe Didn't Blink, have everything ready for the Fringe Festival (news release, postcard, lead line, elevator pitch, waivers, emergency forms - oh - you get it), have the back raspberry garden weeded, clean my house to within an inch of its life all the while cooking sumptuous meals. What the mirror would reflect is someone staring blankly at the computer screen wondering how to get a mirror to fall from the sky (onstage) without causing a mess, a dirty home and someone spending way too much time rubbing the cat's tummy. There were a lot of expectations. My sugar pea plants are teaching me patience. They grow about 1/4 inch every two days (I measure) and so my planned summer risotto with peas and Parmesan would not come from the garden. But from Farmer's Market. And what do you do with teeny-weeny, itsy-bitsy baby sweet peas. Smash em! I put an almost 1 cup of them in 1 tablespoon of water and microwaved them for ten seconds. I barely needed to do that. Using your favorite bread (I used an herbed flatbread), smear some ricotta on them and then bake at about 375 degrees F until the ricotta starts to melt. Add the smashed peas and serve. Proud Italian Cook has a lovely Smashed Peas with Edamame on Ricotta Toasts. Find it here. Meanwhile, I am still betting on solving all the world's problems by Saturday (no pressure) when I am off to spend a week in lobster-land. I have three more days. It's possible. Just as possible as hanging a mirror on a star. Garlic scapes - they make you want to play with your food. When I was a child, I went through a period of loving Lick-a-Maid. It felt so naughty to dip your finger into a packet of colored, flavored sugar and slurp your sugar-coated finger. The finger would eventually turn purple or red or green. It never failed to delight me. Later, I would go home and check my tongue in the mirror. If it was purple, my day was made. I still like days when my day is made over something small. It may seem inconsequential - but it never is. I'm not imbibing straight sugar anymore and the heyday of turning my finger and tongue purple is over. But picking up scapes and looking at their curly ropes still makes me want to play. I tend to create sailors knots with the scapes and dangle them in front of the cat before I finally chopped them. But when it's time to cook - the real play begins. An Italian hummus is devised - perfect for Small-Bites Sunday. Scapes are fleeting. They're the holiday that comes around once a year. And when they're gone - they're truly gone. Nobody trucks in scapes from foreign countries. Scapes are the green tops of the garlic bulbs that farmers cut around this time of year to allow the bulbs to grow larger and stronger. A few years ago it was noted that those scapes had a strong garlic flavor and could be used in cooking. Voila! A new food-trend was born. The cooks got a new form of garlic and the farmers got some cash. .This is from the NY Times. I played with it because playing is appropriate here. I used more lemon and less oil but their recipe is a god place to start. In a food processor pulse scapes, salt, pepper and lemon juice. Add olive oil and pulse still smooth. taste and adjust salt and pepper seasonings. Serve on bread, pita, toasts, crackers or with vegetables. Vegan an vegetarian and good for a crowd. Today, I will smear the spread on pita and add grilled vegetables and call it lunch. Then there is the pesto. There are many varieties - substitute cheeses, nuts, herbs and amounts of oil at will. Just remember to include the scapes. I adapted my usual basil pesto recipe for this. In true Italian fashion,. tt's hard to give exact amounts - I do this to taste. The young basil is very sweet right now - and the scapes are sharp and tangy. It's such an endearing combination - I didn't save the first patch for pasta. I just smeared it on bread and ate it. Right out of the food processor. Sometimes that's the most sensible thing to do. Blend all in a food processor. Taste and adjust. I mean this - tweak this to your sensibilities. I'm sure the amounts I listed were not the ones I wound up with - I alter a lot. Think of the amounts as a starter. You might want more scapes or more cheese - I often want it creamier and add more olive oil. When satisfied, use immediately as a spread or a pasta sauce or atop chicken or pizza. If you think a "taste of June" is warranted in January, pour into a freezer-proof container. Layer a little bit of olive oil on top of freeze. It will be very welcome in the winter! Add the scapes into your favorite pasta dish. (Pasta with sausage and rapini). Just saute the scapes first - it mellows them. ... marks the beginning of the white ones. I don't bring them inside anymore. I discovered you needed to own an anteater to do that. All is fleeting in June - which makes you appreciate it even more. 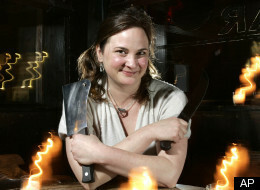 We are at Week 50 of Gourmet's List of Female Game Changers in Food and Julie Powell is our parting game-changer. Love her or hate her (she does evoke controversy in the blogging and food world), Powell seemed to blast open the food blogging world with her mission to do every one of Julia Child's recipes from Mastering the Art of French Cooking in one year - in a tiny Queens kitchen. From that effort she spawned a book (Julie and Julia) and a movie. For those unfamiliar with her, her biography is here. Her current blog can be found here (although it is woefully out of date). I came upon Julie Powell via her book - which was remaindered at Barnes and Noble years ago. Intrigued by the combination of the tiny Queens kitchen (grew up in Queens) and Julia Child, I had to give it a go. I am addicted to "remaindered" books - they're like flea markets. Somewhere in the pile of "stuff," there is a chance at an unpolished gem. I bought the book and devoured it one summer evening. I liked her challenge. There was no movie deal yet and the huge buzz that would come had not happened. Interestingly that when I went to her blog (now a new blog, the year of Julia Child was over), I did not linger. But while her blog did not engage me, her year with Julia Child did. Powell is a writer - not a chef. She found her voice that year - and it's a voice that not every ones loves - but it is her distinctive voice. Powell's second book Cleaving - about the art of butchering and her extra-marital affair did not quite capture the public's imagination the way Julie and Julia did. It will be interesting to see Part Three in her journey. Powell is a Texas gal and I chose these sweet potato tacos as the last game-changing recipe. It's not her recipe - she wrote the narrative describing her perfect easy taco-entertaining party. Deborah Schneider provided the recipes. Find the original article here. I was drawn to these because they are fresh - there is no gloppy sauce as is the case of most Mexican food in Minnesota. Also - they are vegetarian and can be vegan - giving me an alternative when I have guests who now all have more dietary restrictions than there are lakes in Minnesota. In true Powell style, I did some substituting. I have a limit of going to the grocery store twice in a day. If I still have forgotten an ingredient - I make do! Preheat oven to 400 degrees F. Heavy a heavy ovenproof skillet over medium high-heat. Add 1 tablespoon of oil to pan and then add onion and pepper. Cook, stirring until lightly caramelized. (about 10 minutes). Stir in garlic and 1 teaspoon of salt. In another bowl, toss sweet potato with 1/2 tablespoon oil and 1/2 teaspoon of salt. Add to skillet and cook, stirring for about 1 minute. Place pan in oven and roast for 15 minutes. I simply served it with sour cream and pico de gallo. If going vegan, of course omit the sour cream. In retrospect - it didn't need it. I loved it sauceless. The varied colors and crunchy, creamy textures told me that my suspicion was correct and I have a lot to learn about Mexican cooking - even Tex-Mex. I should apply my Italian cooking mantra to Mexican cooking - when it's in season and bursting with flavor - don't dress the dish too much - give your ingredients room to have their say. As the 50th week draws to a close, I want to thank Mary from One Perfect Bite for including me on this journey. I came halfway into the project and was still able to experiment and shake up my kitchen with recipes that are out of my tidy, Italian comfortable world. If you're curious about who Gourmet chose as their female game-changers in food, find the list here. It proved to controversial. ("Too many food bloggers!," "Where's Marion Cunningham, Lynn Rossetto-Kasper?" "What's Rachel Ray doing there?" etc.) Some of the bloggers are going on to Week 51 - chronicling their favorite female game-changer left off the list. If I was going for one more week, I'd probably be covering Ruth Reichl. I devour her words. I also want to thank my fellow-bloggers who welcomed me late into the group and have been cheerleaders for everyone involved. This is the first "blogging group" I have ever joined and it has proven to be a haven of creativity. I wonder if any other "group" will ever match your generosity of spirit, information and taste sensations.Thank-you, all! See you in cybersphere. Valerie from More than Burnt Toast took on the Herculean task of chronicling the fifty weeks and everyone's recipe choice. Find it here. The scope will amaze you - you can eat (and eat well) from that page alone for a year! I hope you all take a look at it (and hope Gourmet Live does also). It's an amazing journey into the female game-changers. Be sure to stop by and see what other bloggers in the group are doing for Julie Powell!